Download "Patient Protection and Affordable Care Act (HR 3590) Selected Prevention, Public Health & Workforce Provisions"
1 Patient Protection and Affordable Care Act (HR 3590) Selected Prevention, Public Health & Workforce Provisions Selected Prevention and Public Health Provisions Essential Health Benefits Requirements (Sec. 1302) Includes an essential health benefits package that covers essential health benefits defined by the Secretary and limits cost-sharing. Included in the general benefit categories are preventive and wellness services and chronic disease management, maternity and newborn care, mental health and substance use disorder services, and pediatric services, among other things. 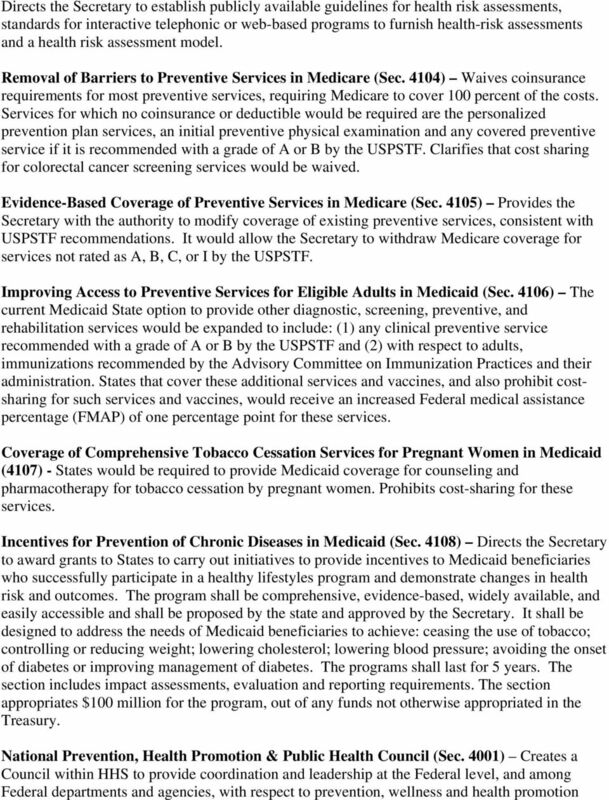 Coverage of Preventive Health Services (Sec. 2713) Stipulates that a group health plan and a health insurance issuer offering group or individual health insurance coverage shall provide coverage for and shall not impose any cost sharing requirements for: (1) evidence based items or services that have in effect a rating of A or B in the current recommendations of the US Preventive Services Task Force (USPSTF); (2) immunizations that have in effect a recommendation from the Advisory Committee on Immunization Practices of the CDC with respect to the individual involved; (3) with respect to infants, children, and adolescents, evidence-informed preventive care and screenings provided for in the comprehensive guidelines supported by HRSA; (4) with respect to women, additional preventive care and screenings not described in paragraph (1) as provided for in comprehensive guidelines supported by HRSA; States that for the purposes of this Act, and for the purposes of any other provision of law, the current recommendations of the United States Preventive Service Task Force regarding breast cancer screening, mammography, and prevention shall be considered the most current other than those issued in or around November States that nothing in this subsection shall be construed to prohibit a plan or issuer from providing coverage for services in addition to those recommended by United States Preventive Services Task Force or to deny coverage for services that are not recommended by the Task Force. Medicare Coverage of Annual Wellness Visit Providing a Personalized Prevention Plan (Sec. 4103) Provides Medicare Part B coverage, with no co-payment or deductible, for personalized prevention plan services. Personalized prevention plan services means the creation of a plan for an individual that includes a health risk assessment and may include other elements, such as updating family history, listing providers that regularly provide medical care to the individuals, BMI measurement, and other screenings and risk factors. The personal prevention plan would take into account the findings of the health risk assessment and would be completed prior to or as part of a visit with a health professional. The personalized health advice and referral may include community-based lifestyle interventions to reduce health risks and promote self-management and wellness, as well as lists of risk factors and a screening schedule. 5 the Administration on Aging that are evidence-based and have demonstrated potential to help Medicare beneficiaries reduce their risk of disease, disability and injury by making healthy lifestyle choices. CMS and AOA shall also conduct an evaluation of exiting community prevention and wellness programs. The Secretary shall submit a report to Congress on recommendations to promote healthy lifestyles and chronic disease self-management for Medicare beneficiaries; relevant findings; and the results of the evaluation. Removing Barriers and Improving Access to Wellness for Individuals with Disabilities (Sec. 4203) Requires the establishment of standards for accessible medical diagnostic equipment for individuals with disabilities. Immunizations (Sec. 4204) Authorizes states to obtain additional quantities of adult vaccines through the purchase of vaccines from manufacturers at the applicable price negotiated by the Secretary and authorizes a demonstration program to improve immunization coverage. Reauthorizes the Immunization Program under Section 317 of the PHSA. 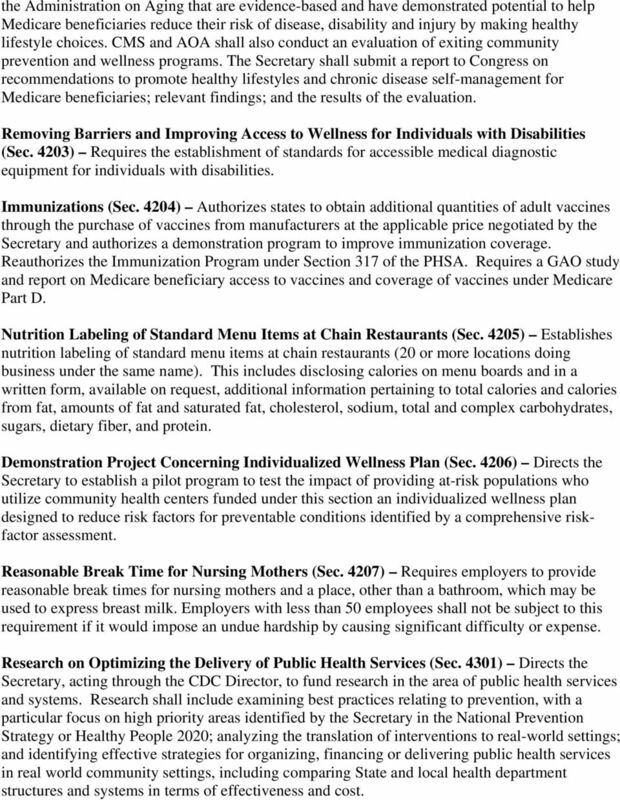 Requires a GAO study and report on Medicare beneficiary access to vaccines and coverage of vaccines under Medicare Part D. Nutrition Labeling of Standard Menu Items at Chain Restaurants (Sec. 4205) Establishes nutrition labeling of standard menu items at chain restaurants (20 or more locations doing business under the same name). This includes disclosing calories on menu boards and in a written form, available on request, additional information pertaining to total calories and calories from fat, amounts of fat and saturated fat, cholesterol, sodium, total and complex carbohydrates, sugars, dietary fiber, and protein. Demonstration Project Concerning Individualized Wellness Plan (Sec. 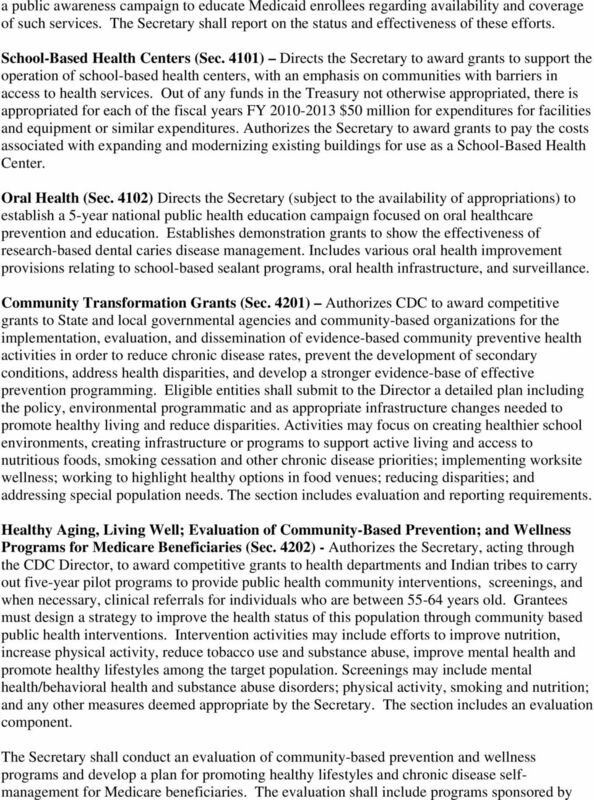 4206) Directs the Secretary to establish a pilot program to test the impact of providing at-risk populations who utilize community health centers funded under this section an individualized wellness plan designed to reduce risk factors for preventable conditions identified by a comprehensive riskfactor assessment. Reasonable Break Time for Nursing Mothers (Sec. 4207) Requires employers to provide reasonable break times for nursing mothers and a place, other than a bathroom, which may be used to express breast milk. Employers with less than 50 employees shall not be subject to this requirement if it would impose an undue hardship by causing significant difficulty or expense. Research on Optimizing the Delivery of Public Health Services (Sec. 4301) Directs the Secretary, acting through the CDC Director, to fund research in the area of public health services and systems. Research shall include examining best practices relating to prevention, with a particular focus on high priority areas identified by the Secretary in the National Prevention Strategy or Healthy People 2020; analyzing the translation of interventions to real-world settings; and identifying effective strategies for organizing, financing or delivering public health services in real world community settings, including comparing State and local health department structures and systems in terms of effectiveness and cost. 6 Understanding Health Disparities: Data Collection and Analysis (Sec. 4302) Requires the Secretary to ensure that any ongoing or federally conducted or supported health care or public health program, activity, or survey collects and reports, to the extent practicable, data on race, ethnicity, gender, geographic location, socioeconomic status, language and disability status, in addition to data at the smallest geographic level. The Secretary shall analyze the data to detect and monitor trends in health disparities and disseminate this information to relevant Federal agencies. Employer-Based Wellness Programs (Sec. 4303) Directs CDC to provide employers with TA, consultation and tools in evaluating wellness programs and build evaluation capacity among workplace staff. Directs CDC to study and evaluate employer-based wellness practices. Clarifies that any recommendations, data or assessments carried out under this part shall not be used to mandate requirements for workplace wellness programs. Grants for Small Businesses to Provide Comprehensive Workplace Wellness Programs (Sec ) - Directs the Secretary to award grants to small businesses to provide employees with access to comprehensive workplace wellness programs. Pain Management (Sec. 4305) Calls for an IOM Conference on Pain and includes various provisions relating to pain research and pain care education and training. Funding for Childhood Obesity Demonstration Project (Sec. 4306) CHIPRA established a Childhood Obesity Demonstration Project and authorized $25 million for FY This section appropriates $25 million for the Secretary to carry out the demonstration project in FY 2010 FY Effectiveness of Federal Health and Wellness Initiatives (Sec. 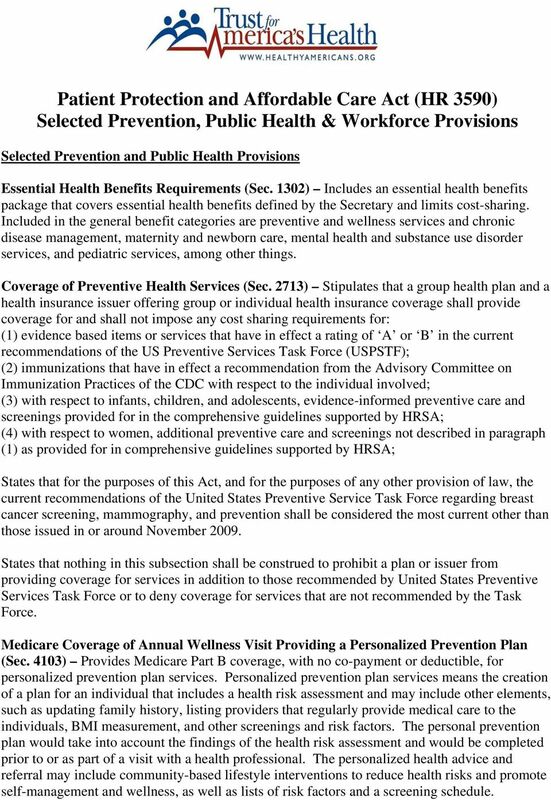 4402) - Requires the Secretary of HHS to evaluate all existing Federal health and wellness initiatives and report to Congress concerning the evaluation, including conclusions concerning the reasons that such existing programs have proven successful or not successful and what factors contributed to such conclusions. Better Diabetes Care (Sec ) - Directs the Secretary, acting through the CDC Director, to prepare on a biennial basis, a national diabetes report card. Directs the Secretary and the IOM to study the impact of diabetes on the practice of medicine and the level of diabetes medical education that should be required prior to licensure, board certification and board recertification. Cures Acceleration Network (Sec ) - Requires the NIH Director to establish a Cures Acceleration Network to accelerate the development of high need cures, including the development of medical products and behavioral therapies. Centers of Excellence for Depression (Sec ) - Establishes a Network of Health Advancing National Centers of Excellence for Depression. 7 Programs Relating to Congenital Heart Disease (Sec ) - Authorizes the Secretary, acting through the Director, to establish programs relating to congenital heart disease, including the formation of a National Congenital Heart Disease Surveillance System. Young Women s Breast Health Awareness and Support of Young Women Diagnosed with Breast Cancer (Sec ) - Establishes a public education and a healthcare professional education campaign regarding women s breast health. National Diabetes Prevention Program (Sec. 5316) - Creates a CDC National Diabetes Prevention Program targeted at adults at high risk for diabetes, which entails a grant program for community-based diabetes prevention program model sites. 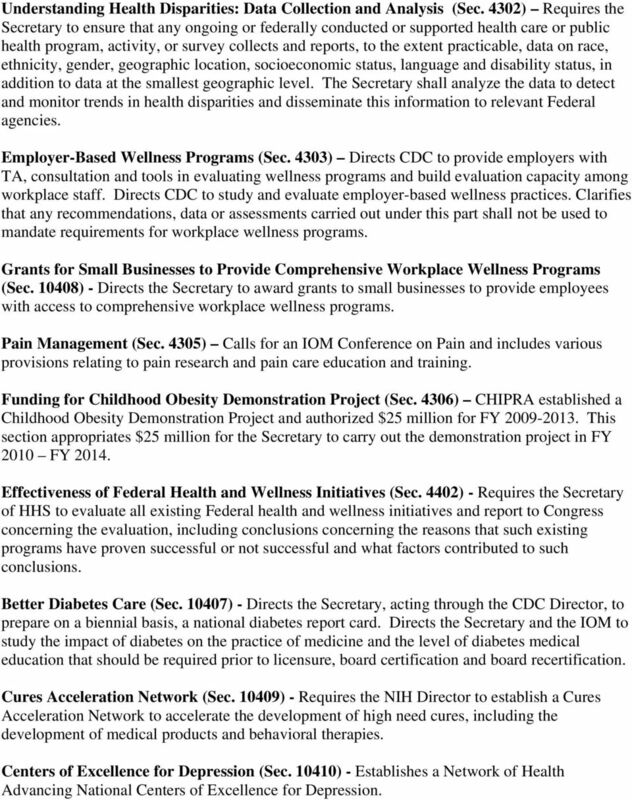 8 Selected Workforce Provisions National Health Care Workforce Commission (Sec. 5101) Establishes a commission to serve as a national resource for Congress, the President, States and Localities, determine whether the demand for health care workers is being met, identify barriers to coordination and encourage innovation. It shall disseminate information on retention practices for health care professionals and shall review current and projected health care workforce supply and demand and make recommendations regarding healthcare workforce priorities, goals and policies. The Commission shall communicate and coordinate with a variety of federal agencies and departments. Specific topics to be reviewed include health care workforce supply and distribution, health care workforce education and training capacity; existing education loan and grant programs, the implications of federal policies; the healthcare workforce needs of specific populations, and recommendations creating or revising loan repayment and scholarship programs. Public health professionals are included in the definition of health care workforce and the definition of health professionals. Public health workforce capacity is also included in the high priority areas list. State Health Care Workforce Development Grants (Sec. 5102) Establishes a competitive healthcare workforce development grant program to enable State partnerships to complete comprehensive planning and to carry out activities leading to coherent and comprehensive health care workforce development strategies at the State and local levels. Authorizes $8 million for planning grants and $150 million for implementation grants for FY 2010 and such sums for each subsequent year. Health Care Workforce Program Assessment (Sec. 5103) Codifies the existing National Center for Health Care Workforce Analysis to provide for the development of information describing the health care workforce and the analysis of related issues and collect, analyze and report data related to programs under this title. The National Center and relevant regional and State centers and agencies shall collect labor and workforce information and provide analyses and reports to the Commission. Public Health Workforce Recruitment and Retention Programs (Sec. 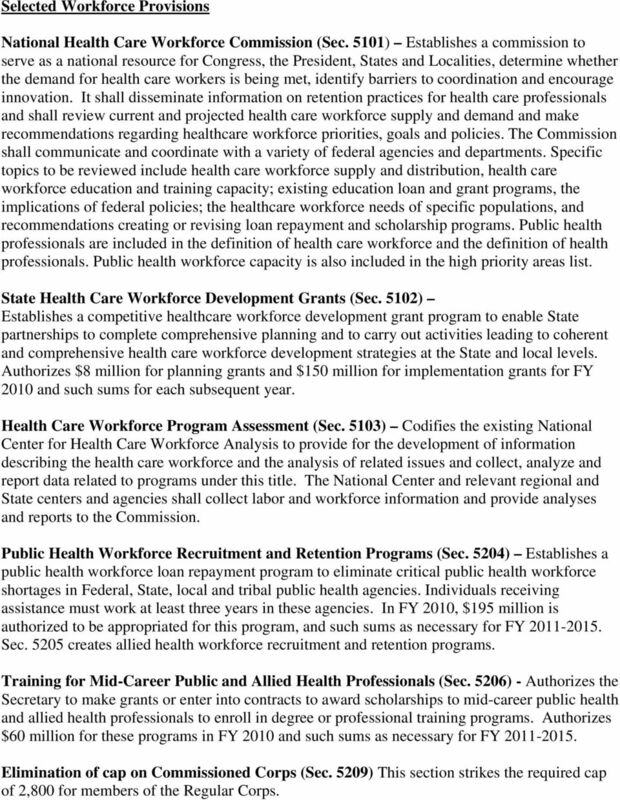 5204) Establishes a public health workforce loan repayment program to eliminate critical public health workforce shortages in Federal, State, local and tribal public health agencies. Individuals receiving assistance must work at least three years in these agencies. In FY 2010, $195 million is authorized to be appropriated for this program, and such sums as necessary for FY Sec creates allied health workforce recruitment and retention programs. Training for Mid-Career Public and Allied Health Professionals (Sec. 5206) - Authorizes the Secretary to make grants or enter into contracts to award scholarships to mid-career public health and allied health professionals to enroll in degree or professional training programs. Authorizes $60 million for these programs in FY 2010 and such sums as necessary for FY Elimination of cap on Commissioned Corps (Sec. 5209) This section strikes the required cap of 2,800 for members of the Regular Corps. 9 Establishing a Ready Reserve Corps (Sec. 5210) - Assimilates active duty Ready Reserve Officers into the Regular Corps & establishes a Ready Reserve to participate in training exercises, be available and ready for involuntary calls to active duty during national emergencies and public health crises, be available for deployment and for backfilling positions left vacant during deployment of active duty Corps members, and be available for service in isolated, hardship & medically underserved communities. This section authorizes $5 million for FY 2010 FY 2014 for carrying out the duties and responsibilities of the Commissioned Corps under this section and for recruitment and training; and $12.5 million for the Ready Reserve Corps for FY 2010 FY Grants to Promote the Community Health Workforce (Sec. 5313) Directs the Director of CDC to award grants to promote positive health behaviors and outcomes for populations in medically underserved communities through the use of community health workers. Epidemiology-Laboratory Capacity Grants (Sec. 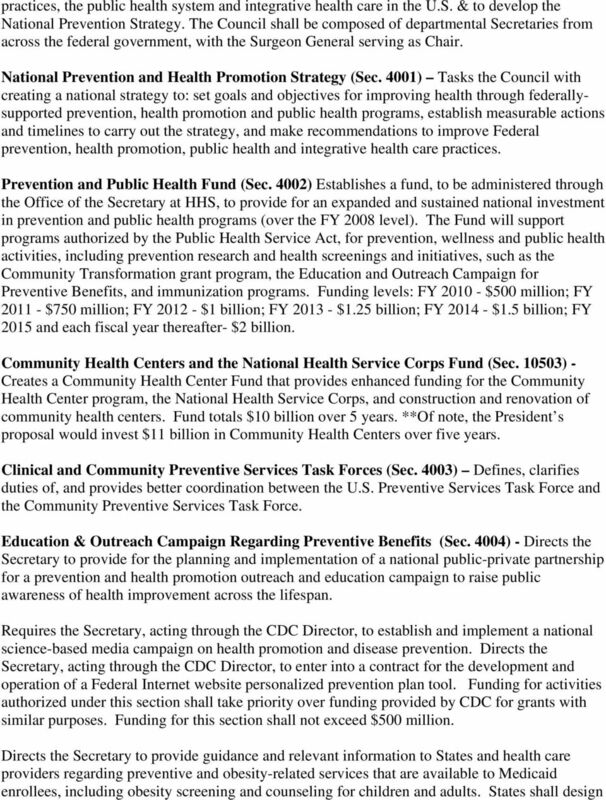 4304) Directs the Secretary (subject to the availability of appropriations) to establish an Epidemiology and Laboratory Capacity Grant Program to award grants to eligible entities to assist public health agencies in improving surveillance for and response to infectious diseases and other conditions of public health importance. Authorizes $190 million for each year of fiscal years to carry out this section. Fellowship Training in Public Health (Sec. 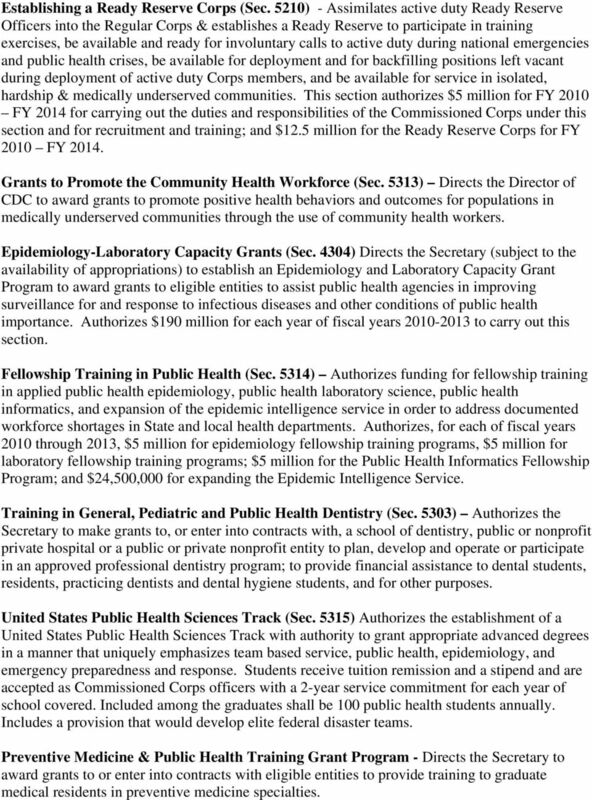 5314) Authorizes funding for fellowship training in applied public health epidemiology, public health laboratory science, public health informatics, and expansion of the epidemic intelligence service in order to address documented workforce shortages in State and local health departments. Authorizes, for each of fiscal years 2010 through 2013, $5 million for epidemiology fellowship training programs, $5 million for laboratory fellowship training programs; $5 million for the Public Health Informatics Fellowship Program; and $24,500,000 for expanding the Epidemic Intelligence Service. Training in General, Pediatric and Public Health Dentistry (Sec. 5303) Authorizes the Secretary to make grants to, or enter into contracts with, a school of dentistry, public or nonprofit private hospital or a public or private nonprofit entity to plan, develop and operate or participate in an approved professional dentistry program; to provide financial assistance to dental students, residents, practicing dentists and dental hygiene students, and for other purposes. United States Public Health Sciences Track (Sec. 5315) Authorizes the establishment of a United States Public Health Sciences Track with authority to grant appropriate advanced degrees in a manner that uniquely emphasizes team based service, public health, epidemiology, and emergency preparedness and response. Students receive tuition remission and a stipend and are accepted as Commissioned Corps officers with a 2-year service commitment for each year of school covered. Included among the graduates shall be 100 public health students annually. Includes a provision that would develop elite federal disaster teams. Preventive Medicine & Public Health Training Grant Program - Directs the Secretary to award grants to or enter into contracts with eligible entities to provide training to graduate medical residents in preventive medicine specialties. I. Insurance Reforms and Expansion of Coverage. Implementation Date Plan years beginning on or after six months after passage of the Act. TRENDNOTES. Opportunities for Preventing Childhood Dental Caries through Implementation of Health Care Reform. Trend. Welcome Please stand by. We will begin shortly.